He’s done it again! Five-year-old Miles Scott, notoriously known as “Batkid,” just defeated the villains once more — this time, with the help of some pilots and an F-15. Miles, a Tulelake, Calif. native, is in remission from leukemia, and, thanks to the Make-A-Wish Foundation, managed to turn his obsession with comic book heroes into the real thing in November when he became “Batkid.” Thousands of San Francisco residents showed up to cheer Miles on during his quest to save the city of San Francisco (or Gotham-for-the-Day). For this mission, Miles reported for duty at the Oregon Air National Guard’s 173rd Fighter Wing as part of the Pilot for a Day program on April 10, according to Tech. Sgt. Jefferson Thompson and the 114th Fighter Squadron. But this time, flying in his ‘batsuit’ was not on the agenda: Miles wore an F-15 pilot uniform, along with helmet, mask, and at one point, night vision goggles. The batman symbol was tacked on his jet with the help of crew chief Tech. Sgt. Cliff Rutlege, who created the replica in honor of Miles’s visit. Miles and his family watched takeoffs, and Miles sat in the cockpit of a jet thanks to instructor pilot Maj. Richard Giampietri. But to get himself ready for the main mission of the day, Miles experienced the parachute shop and Aircrew Flight Equipment materials. Then, “Batkid” was back: Giampetri commissioned Batkid to defeat super-villains, The Riddler and Joker, who planned to use stolen Russian MiGs to wreak havoc on the world at large, Thompson writes. 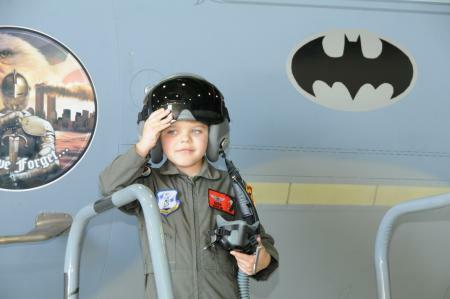 Batkid went head-to-head with the villains in the 173rd Fighter Wing F-15 simulator. He emerged victorious and with a wide smile.